In August 2013, three masked men took paintings by Shishkin and Korovin from a local museum about 300 kilometers (180 miles) east of Moscow. This is the latest theft of artwork by famous Russian artists, but it undoubtedly will not be the last. According to Interpol, Russia beats out France, Italy and Germany in the number of items stolen from its museums. 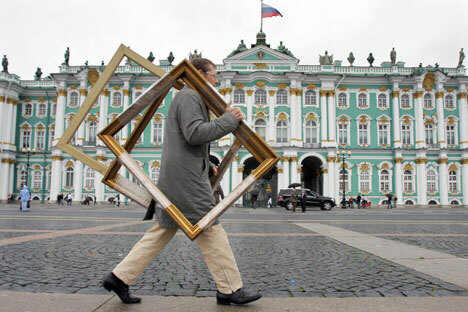 Over the last 15 years, the Russian Interior Ministry estimates that nearly $1 billion worth of cultural works have been stolen from Russia and taken abroad. Of course, the leader in terms of stolen items is The State Hermitage Museum in St. Petersburg — the largest museum in Russia and one of the largest art and historical museums in the world. It is known for a scandalous disappearance of jewelry in 2006 and the theft of a painting by Jean Leon Gerome, "Pool in a Harem," in 2001. "Pool in a Harem,” which is valued at $1 million, was cut out of the frame and stolen while the caretaker briefly left the room. The loss was discovered in 2006 in Moscow. Obviously, the thief could not sell the famous painting, so he came to a reception of the Communist Party leader Gennady Zyuganov and left the painting in a paper bag near security. The picture was folded four times and torn in several places. Zyuganov returned the picture to the Hermitage. The next scandal in 2006 was related to the disappearance of more than 200 items of jewelry with an estimated value of 130 million rubles ($3,9 billion), which became known after the publication of audits of funds that were missing for almost 30 years. Out of a total of 19 missing items listed for a living guardian, others were "owned" by Russia’s beloved "dead souls" — dead keepers and Larisa Zavadskaya, who died during the verification process. Her husband pleaded guilty in court. Over the past seven years, the stolen items had been floated abroad and across Russia, sometimes in garbage bins (as was the icon of the Cathedral of All Saints, which cost $200,000). St. Petersburg also accounted for the other most notorious crimes in the field of art in recent years: the theft of a Sami rifle from the restoration workshop of the Ethnographic Museum, a homemade flintlock peasant rifle, a Turkish scimitar sword and a Georgian saber. A curator secretly sold 180 objects from the Museum of the History of St. Petersburg. Many museums are in poor condition and do not have advanced security systems. Almost all rural museums suffer from raids by robbers. "We have a signaling button at the museum,” said the head of the Chukovsky Museum in Peredelkino. "Most museums have to put in at least a police post." In museums that operate using volunteers, there is not enough money even for the installation of alarm systems. Usually, thefts from Russian museums do not look like Hollywood movies, where criminals cleverly and under the cover of night extract treasures from closely guarded institutions. In 1995, an employee of the Darwin Museum in Moscow, during a move to a new building, stole more than 50 items, including sculptures, paintings and taxidermy animals. In 1998, at the Kuntsevo Museum of Local History in Moscow, guards stole more than 50 coins from the 18th and 19th centuries. In 1994, an electrician of The State Hermitage Museum stole the rarest Egyptian cup valued at $500 million. During the tenure of the previous director of the Mayakovsky Museum, 54 items from the collection have disappeared. The new museum director, Nadezhda Morozova, wrote an official letter to the prosecutor's office and has attempted to find traces of other items. She believes that “all the missing items from museums in Russia are by chance and rarely associated with the actions of employees.” In 2008, the government commission for the preservation of cultural values identified nearly 160,000 works of art that were absent from Russian museums. Russian thieves love paintings by Ivan Aivazovsky, who is famous for paintings with a nautical theme. For example, in 1991, his painting "Early Morning at Sea" was stolen from the Serpukhov Historical and Art Museum, and the painting "The Solar Eclipse in Feodosia” (valued at $1.5 million) was stolen from the Russian Geographical Society in 1994. In 1997, the painting "Niagara Falls” disappeared from Vologda Museum. In July 1997, the thieves were arrested while trying to sell the painting. In August 2003, it was discovered that paintings by Ivan Aivazovsky (" Sunrise ") and Alexei Savrasov ("Autumn") were stolen from the vaults of the Astrakhan State Art Gallery. The insurance value of each painting was $2 million. As it turned out, the restorer of the museum was in cahoots with the director of the gallery. The keeper took out the pictures during a restoration four years ago and returned copies of average quality. During the investigation, it was found that Savrasov’s design was spoiled in the course of restoration and lost its artistic value. All three defendants fell under the amnesty declared by the State Duma of the Russian Federation in 2000. Aivazovsky's canvas "Sunrise" has not been found. In 1992, fourteen paintings by Russian artists (including Kustodiev and Aivazovsky) with a total price on the black market of about $150,000 were stolen from the exhibition of the Art Museum of the city of Sochi. After 12 years, the investigation into the theft of paintings was closed in 2004. Thirteen paintings were returned to the museum, and the last picture by Kustodiev, "Roofs," was found in the United States. Thieves also love paintings of Russian philosopher, artist and traveler Nicholas Roerich. In 2008, "The News of Shambala," "Shadow of a Teacher," "Boom-Erdeni" and "Sergius the Builder” were stolen from the apartment where the painter’s son and renowned Asian scholar Yuri Roerich was living. According to experts, the cost of the missing paintings totaled millions of euros. Meanwhile, in New York, the criminals brought two paintings from the museum named after the artist: a pencil drawing, "Himalaya," and an oil painting, "The Monastery Talung." The cost of the stolen paintings was about $100,000. It is worth nothing that much of the art stolen in Russia shows up on the black market and in antique stores in New York. Not so long ago, hundreds of pictures by Yakov Chernihov stolen from the Russian State Archive of Literature and Art were found there. It is estimated that, in America and England, antiques are in greater demand than in Russia — especially since, as soon as the object hits the market in London or New York, its origins are much easier to hide or change. Stolen items from Russian museums emerge in the markets in New York almost every month and at auctions like Christie's surface even more often. For example, two items from the collection of the Mayakovsky Museum were found with the museum seals at an auction in London. Cold calling several antique shops and galleries in Moscow revealed nothing. Most of the representatives responded that they could not help and hung up the phone, while others claimed that the process of accepting new things in the shops is very strict and they work with people with passports only. They also have “never encountered stolen things that are actually very hard to sell in the capital legally,” said the manager of Antikvarnaya Lavka. Quite strange cases of theft happen in Russia pretty often, as well. For example, in 2005, there was a famous case of the theft of two, 50-ton, pre-revolutionary locomotives from a former Gulag settlement in the Krasnoyarsk region of Siberia. The estimated value of the locomotives is hundreds of thousands of euros. The main intrigue is that, in the abandoned railroad track of Ermakovo village, all railways were dismantled. It is believed that the robbers spent many months building a new road using abandoned old rails scattered around the area, then used the rails to bring the locomotives to the bank of the Yenisei River and load them onto barges. The steam locomotives disappeared without a trace.